Gawkers loitering in London’s West End last week were both surprised and fascinated by the strange arrangements unfolding before their eyes. 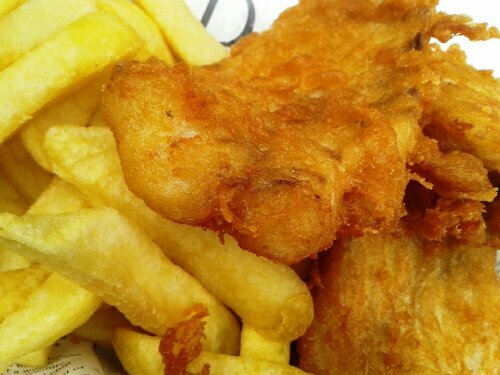 Summertime in London is typically heralded by swarms of hungry office workers languishing lazily on coveted patches of grass whilst tucking into boring, pre-packed lunches. 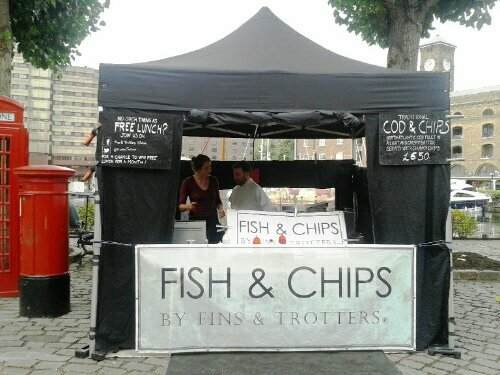 In a manner, Thursday 13th June was like any other day in Soho Square: it was indeed full of hungry bodies eager to consume lunch. It just so happened that lunch was upscaled to silver service and the food was Michelin starred! The announcement of a one day pop-up restaurant in the Capital courtesy of Badoit Water was unexpected. The realisation that it would also be the World’s First Picnic Restaurant was inspired. With a menu devised by award-winning chef Thierry Marx, a handful of lucky applicants, and the first 50 people who turned up on the day, were able to partake in an indulgent and wonderful experience at no cost. It was clear from the start that this would be a glamorous affair: Marx is the owner of the two Michelin-starred Sur Mesure par Thierry Marx restaurant in Paris and the event was meticulously coordinated by Fred Sirieix, general manager of the Michelin-starred Galvin at Windows. Famed for his impeccable style and creative vision, Sirieix ensured that the not so humble picnic had all the necessary touches to recreate fine dining within the confines of the shabby square. 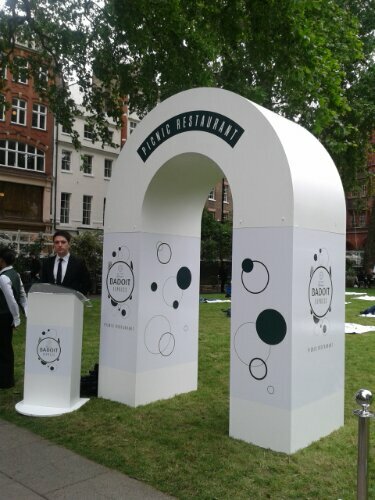 A huge white arch, flanked by a Maitre d’, denoted the entrance to the Badoit Express ‘restaurant’; a spacious area dotted with stylish green and white picnic blankets. A string quartet was nestled in the far corner, playing Lady Gaga tunes and other pop hits while good-looking waiters crouched to ground level to serve 100 lucky guests Badoit water and a three course meal. 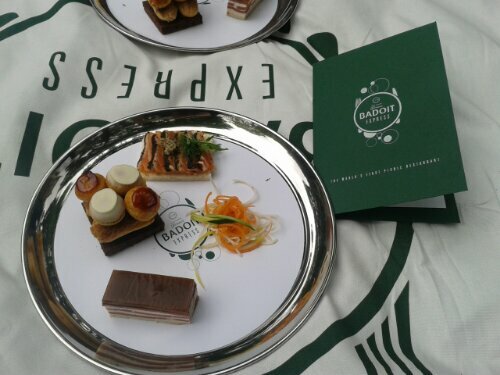 A starter of Label Rouge Salmon with Nori, Ponzu Sauce and Truffles on Toast was served alongside a main of Pastrami Thierry Marx and St Honore Patisserie dessert. They were all brought out on one tray (silver, of course), looking beautiful and elegant; almost too good to eat! 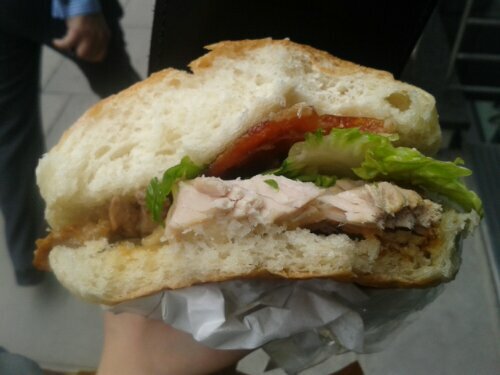 Unfortunately, a cold had robbed me of my full sense of taste that day (I nearly cried!) but even I could tell that the salmon was fresh and delicious. The pastrami was flavoursome and layered with wonderfully soft bread but the star of the meal was the dessert; a soft brownie base topped with two creme-filled eclairs and four dainty profiteroles flavoured with caramel and white chocolate. I can only imagine how intense the flavours must’ve been because even with my cold, I was able to detect the subtle yet intricate differences in every sublime layer. The waiting staff were magnificent; polite, enthusiastic, attentive, helpful, professional and exceptionally attractive. They didn’t rush us and were careful to keep us stocked with Badoit water – hailing from France – which is slightly sparkling and as refreshing as you would expect. My dining guest was my mother, who confirmed that the food was superb and concurred that the overall experience of sitting on the grass in the poshest picnic set up ever seen, was a once-in-a-lifetime and surreal experience that was a privilege to partake in. 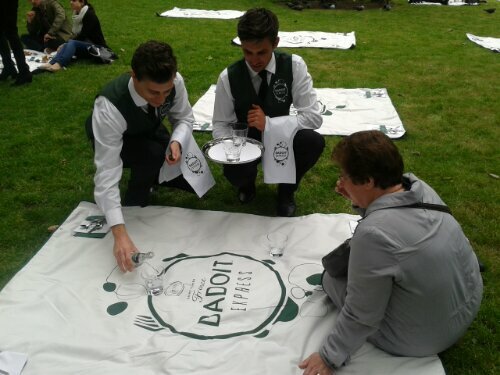 The event is not the first free city picnic Badoit has sponsored: their first foray was last year, when they turned a Parisian commuter train into a free fine dining restaurant. The mind boggles as to where they will go next year and what type of picnic they will come up with, but I have no doubts that it will, once again, be show-stopping and unforgettable. 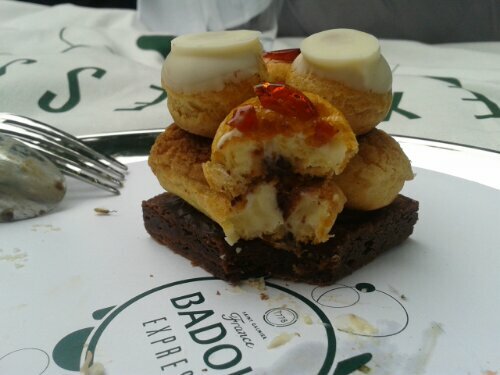 The bar is set high now so whichever way Badoit’s picnic evolves and wherever it pops up next, you can expect nothing less than continued innovation and maximum quality.